NATCHITOCHES – The Back Porch Band and Reverend Charley’s Patent Medicine Show will provide live entertainment for the 44th Annual Melrose Plantation Arts and Crafts Festival during the April 21-22 exhibition days, according to Vicki Parrish, president of the Association for the Preservation of Historic Natchitoches (APHN), the sponsor of the event. The two well-known local bands will join more than 100 vendors featuring myriad hand-made items, many of which are one-of-a-kind. Among the items available to visitors will be original art works, stained glass, gourmet pickles and jellies, hand-made jewelry, clothing, photographs, plants, toys, woodworking products, wrought iron artwork, pottery and other kinds of arts and crafts. Melrose Plantation, located on Highway 119 in southern Natchitoches Parish, is a National Historic Landmark featuring eight historic structures. Tours of the plantation home, the “Big House,” will be available and guides will be on hand at the African House to explain its recent renovation and the display of the restored Clementine Hunter murals, which have returned to their original home on the second floor of that structure. The Back Porch Band will return to the festival, bringing its repertoire of traditional folk and Celtic music. The current band features seven members, all with ties to Natchitoches and most with ties to Northwestern State University. 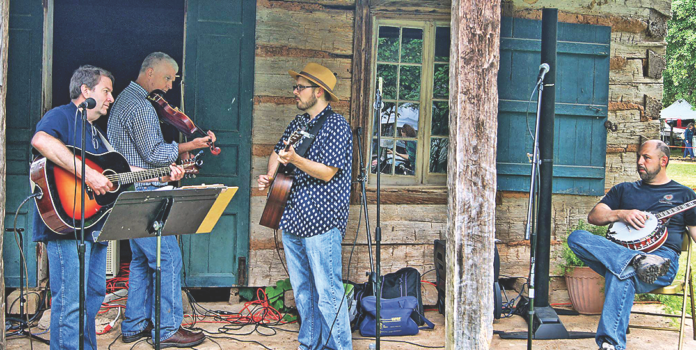 Reverend Charley’s Patent Medicine Show, which returns for the third straight year, will present traditional folk music. Both bands have played throughout Central Louisiana, as well as other areas of the state and neighboring states. The Back Porch Band was created in the late 70s when it was known as Mountain Music. During its 40 years, the band has changed its members as well as its name. The two most veteran members are Dr. Hurst Hall and Dr. Bill Bryant, both retired professors from Northwestern State University (NSU) in Natchitoches. Hall purchased his first guitar when he was five years old, and he played at community events, “school house concerts” and with various bands throughout his life. Hall, Bryant and another NSU professor, Bill Hunt formed Mountain Music which later became the Back Porch Band. Bryant plays several instruments, including the dulcimer, fiddle, guitar, banjo, and Irish Penny Whistle. Dr. Richard Rose, professor emeritus at NSU and a former conductor of the Natchitoches-NSU Symphony Orchestra, has played cello for the band since he became a member in 1995. He also joins most of the members in the vocal selections. Dr. Michael Yankowski brings guitar, banjo, harmonica and percussion to the band. Dr. Burt Allen, Director of Choral Activities and professor of music at NSU, also has been with the Bank Porch Band for several years. He plays the keyboard and performs vocals. Ed Huey is an NSU graduate in Music Education and a music instructor and choral director. He plays the guitar, harmonica, washboard, and spoons, and he joins the others in vocal music. Keith Shirley is the only member not to bring a formal music background to the band, but he has been performing in different venues for many years. He plays bass and sings. The Back Porch Band has played at the NSU Folk Festival, The Jefferson (Texas) Confederate Ball, Briarwood and the Green Market in Natchitoches. The other featured band, Reverend Charley’s Patent Medicine Show, is led by Charles “Reverend Charley” Ward who grew up in a musical family. At the age of 13 he started playing folk tunes on his guitar, but he didn’t start playing professionally until 30 years later. The Reverend’s folk music reflects his earliest music memories of Woody Guthrie, Pete Seeger, Leadbelly,and Bob Dylan, all of whom influenced his style. He is joined by Frank Willis who plays a left-handed five-string fiddle and a “claw hammer” banjo, Rick Adams on guitar, mandolin and harmonica, Chris Wilson plays bass, harmonica, dobro guitar and banjo and John Neal who plays banjo and guitar. The Medicine Show band has played throughout Louisiana including gigs at the Blue Moon Café, the Blue Dog Café in Lafayette, Natchitoches Folk Life Festival, Blooming Arts on the Bricks in Natchitoches, Oakland Plantation, the Olla Bluegrass Festival, Abita Springs Opry, the Alexandria Museum of Arts and the Wild Side of the Arts and Les fest at the Alexandria Zoo. Their benefit concerts have included gigs at Tipitina’s Musicians Co-op, Turning Point Women’s Shelter, Manna House, Pineville Humane Society and the Red Cross. The Melrose Plantation served as a retreat for many artists during the early 20th century, a period often referred to as the “Southern Renaissance.” Many renowned writers and artists visited and lived at the plantation during those years, including Lyle Saxon, who wrote his best-known novel, “Children of Strangers,” while living at Melrose. His story was based on the culture of Melrose and the Cane River area. Francois Mignon lived at Melrose for 32 years and wrote his “Plantation Memo” and several thousands of pages of journal entries during that time. Probably the best known resident of Melrose was Clementine Hunter, who came to the plantation as a field hand and taught herself how to paint using paints and brushes discarded by an artist at Melrose. Hunter’s paintings have gained national and international notoriety and some of her works hang in the Louvre in Paris. She is one of the most recognized primitive artists in Louisiana history and her home is among the historic structures at Melrose. The festival is sponsored by APHN and annually attracts more than 2,000 visitors during the two-day event. The Melrose Arts and crafts Festival will open at 9 a.m. on Saturday and 10 a.m. on Sunday. Tickets are $5 for adults and $2 for children ages 6-12. Tickets for tours of the Big House are $5. Self-guided tours of the grounds and viewing of all the historic buildings are free. For more information about Melrose Plantation and the annual Arts and Crafts Festival, visit www.melroseplantation.org.